To photographers of a certain generation, a filter is an optical element that you screw on to the end of your lens; it alters the light to achieve some kind of effect. 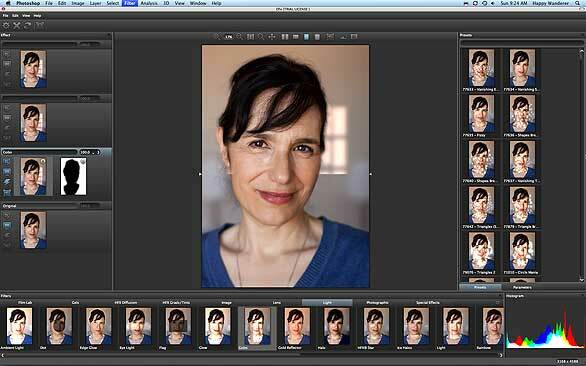 To the digital photographer, a filter is usually a plug-in that you add to your image editor. It’s very fitting, then, that Tiffen, one of the leading manufacturers of lens filters, has released a package of plug-in filters that simulate the effects of their real-world lens filters; and it's very exciting that Tiffen has done such a good job in producing a plug-in collection that’s useful and performs well. This program ships as a stand-alone application, or as a suite of plug-ins for Photoshop (and applications that support Photoshop-compatible plug-ins, such as Apple Aperture) or for video applications including Apple Final Cut Pro, Avid Xpress, and Adobe After Effects. We looked at the Photoshop version for this review. The complete Dfx Version 2 package provides 110 different filters, but each filter has a number of customizable parameters, and these parameters can be saved as presets. Tiffen ships over 1,000 presets bundled into the program. Because the presets provide such huge latitude for editing, you can almost look at the package as having 1,000 completely different filters. Over the 20 years of Photoshop’s existence, there have been gobs of plug-in collections, and the majority of them have long since fallen by the wayside. The fact is, it’s possible to come up with a really impressive plug-in technology, but it’s hard to create an effect that people actually need, especially since Photoshop ships with so many useful plug-ins. That’s what’s so impressive about Tiffen’s collection. Designed primarily to make color and tonal adjustments, these filters provide effects that you might find yourself using every day, depending on the type of photography you do. For example, wedding and portrait photographers will appreciate the collection of diffusion filters, which greatly enhance skin tones and provide a soft, romantic look to images. Landscape photographers will appreciate the gradient filters that allow you to greatly improve the look of skies, while photographers of all kinds will find uses for the warming filters, glows, saturation enhancers, and more. If you use Tiffen lens filters, then you’ll recognize the names of some of the filters, as Tiffen has taken care to model both the effects and the names on real-world filters. So, if you already use a Tiffen ProMist filter to create a glowing diffusion effect, then you’ll know what to expect when you apply the ProMist plug-in to a digital image. In addition to crafting very good effects, Tiffen has done something very smart with Dfx. Rather than simply provide a collection of pre-built filters, Tiffen has created an entire editing environment that allows you to customize and combine filters, and even create masks to constrain the effects of different filters. In a package this huge, with this many variations, the ability to quickly locate and preview effects is essential. Dfx shows tabs for different categories of filters: Film Lab, Gels, HFX Diffusion, HFX Gads/Tints, Image, Lens, Light, Photographic, and Special Effects. When you click on a tab, thumbnails of your image with each filter applied are displayed along the bottom of the Dfx window. Click on a filter, and you can see all of its presets. As with the filters, each preset shows a thumbnail of your image with the effect applied. Tiffen Dfx provides a complete editing environment, including previewing and masking controls. Here you can see a before/after preview as a gobo effect is applied through a mask to place a window light behind the subject. All of these preview thumbnails make it easy to zero in on the effect you’re looking for. If you can’t find the perfect effect, you can activate parameter controls that allow you to tweak and alter a preset to create your own look. Extensive split-screen and before/after preview controls are provided, along with a histogram, zoom, and pan tools. As powerful as these filters are, you’ll probably get the best results by combining them, and you can easily do that within Dfx. Filters can be stacked up, with controls provided for deactivating individual filters, altering the opacity of a filter, and more. Most importantly, the program includes seven different masking tools, which allow you to constrain the effect of any filter. In addition to linear, gradient, paintable, and circular masks, the excellent Snap mask can create a mask for you after you paint a few simple strokes to indicate the foreground and background elements in your image. If you tweak any of the filters, you can save those settings as a new preset, and if you create an effect out of a combination of filters, you can save that whole configuration as a special “setup” file. These features make it easy to apply the same look to multiple images. Final output quality is very good, and the filters work on both 8- and 16-bit images. In Photoshop, effects are always applied to the currently selected layer, and there’s no option within the program to create a new layer for the effect, but you can do that yourself. It would be nice to be able to get the program’s masking information back into Photoshop, as an Adjustment Layer, so that you could refine the mask further using Photoshop’s tools. For those who don’t have a copy of Photoshop or Aperture (or any other compatible host program), Dfx is also available as a stand-alone application, which offers the same interface and effects. So, if you’re an iPhoto user, you can still make use of Tiffen’s excellent features. When I first heard about Tiffen Dfx 2, I wasn’t expecting much. Not because of anything to do with Tiffen—I’ve used their filters for years on still and video cameras—but because when hardware companies try to venture into software, the results are often very amateurish. But that is absolutely not the case with the Dfx 2 suite. It is an excellent, very useful collection of effects wrapped up in a smart interface that provides a tremendous amount of customization.